St. Patrick’s Day Cocktail Hour is ticking, and the treat I have for you will strike you like none other. 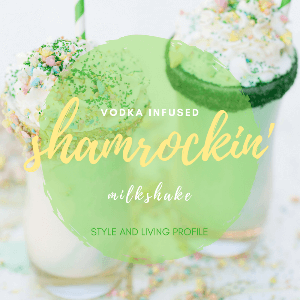 A vodka infused milkshake with Hearts, Stars, Horseshoes, Clovers, and Blue Moons, Hourglasses, Rainbows, and Tasty Red Balloons! Need another hint? It’s magically delicious! 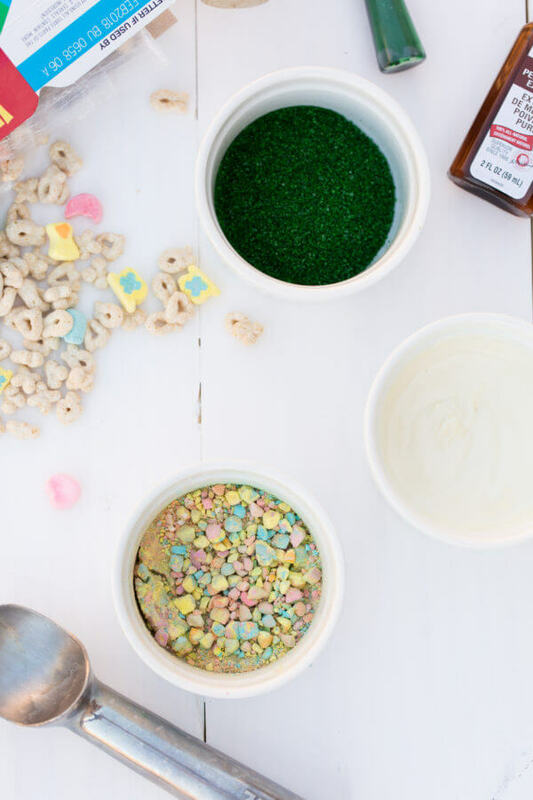 It’s a Lucky Charms-inspired milkshake that’s shamrockin’! Last year we celebrated the classy way. Now, let’s celebrate the cutesy way with an unforgettable St. Patrick’s Day Cocktail. 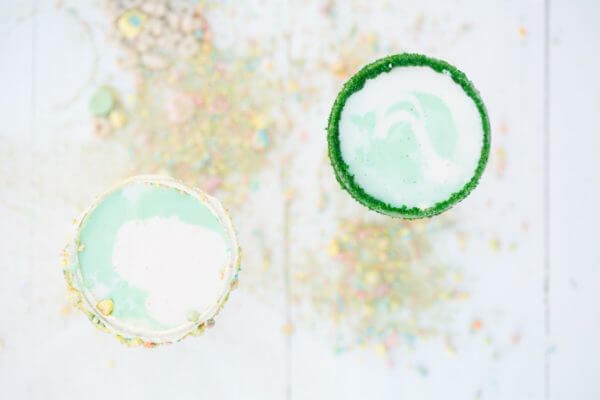 The best part of this fun-filled St. Patrick’s Day Cocktail is the yummy, pastel nubbins. I can snack on Lucky Charms marshmallows everyday of the week. Incorporating this favorite childhood cereal into an adult beverage has me floating on cloud 9. It gets better, the vodka included is whipped cream vodka which some may describe as frosting in a can. If you’re a wimp like me, it’s hardly as sweet as it may smell. You’ll get a sneaky little buzz. Thank me later! Photographs used in this publication are property of Style and Living Profile. Do not republish without permission and credit. 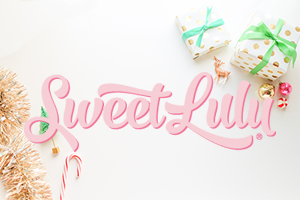 In a ramekin, add melting candy and melt in the microwave for 20-30 seconds. 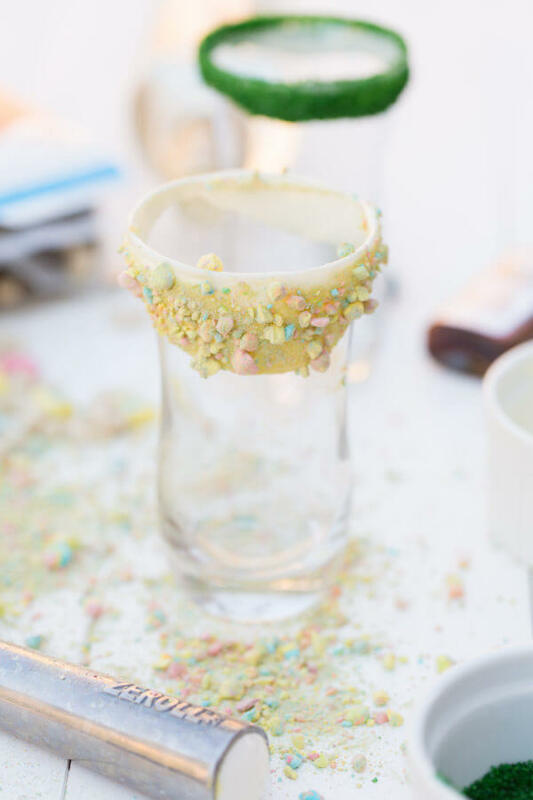 Dip the rim of the glass in the chocolate and then roll in crushed marshmallows or sprinkles. In a blender, add ice cream, vodka and peppermint. Blend until smooth. Pour half of the milkshake into the cups, filling about halfway. Add green food coloring the other half of the milkshake and blend until green. 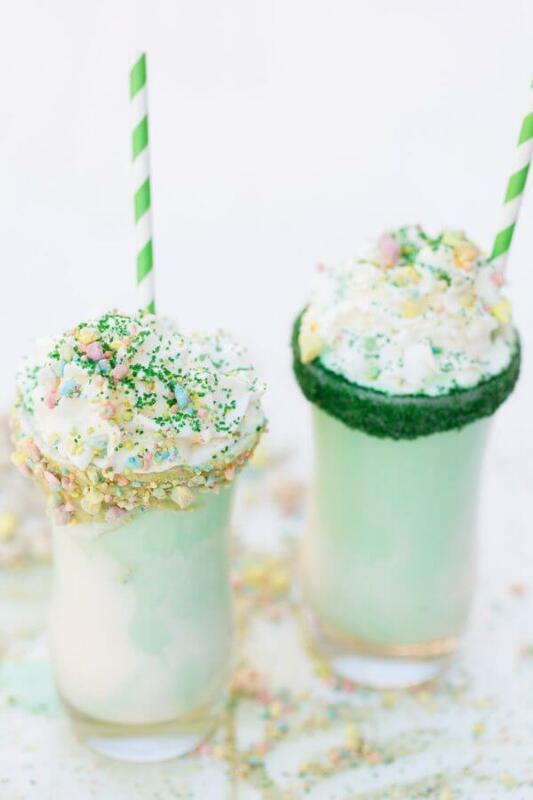 Add the green milkshake to the glasses and top with whipped cream, crushed marshmallows and sprinkles.